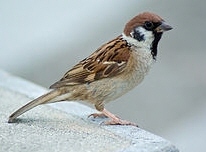 Japanese sparrow is called "Suzume". Suzume birds eat injurious insects so that Japanese regarded them as beneficial birds. From olden days, people liked them and thought that they eat and exterminate bad lucks.